Today appears to be mini PC day here at PCWorld. We’ve already given you hands-on looks at Intel’s Skull Canyon NUC and Zotac’s VR-ready Magnus EN380, not to mention news about the release of MSI’s cylindrical Vortex powerhouse. That makes today a good day to talk about something that was recently announced: two new additions to Asus’ VivoMini line-up, one of which comes with extra graphical oomph thanks to discrete Nvidia graphics. The recently announced VivoMini VM65 and VM65N feature your choice of an Intel “Skylake” Core i3 or the 2.3GHz Core i5-6200U, according to Anandtech. The PCs come loaded with two SO-DIMM slots for up to 16GB of RAM, and space for either a 3.5-inch hard drive or an optional Vivo DualBay to fit in two 2.5-inch storage drives. Ports and other components include 802.11ac Wi-Fi, Bluetooth 4.0, singlular HDMI and dual-mode DisplayPorts, four USB 3.0 ports, and—on the VM65N only—a pair of Type-A USB 3.1 connections. The VivoMini has a 7.48-inch square footprint with a height of 2.21 inches. That tiny size, which is a little bit bigger than the NUC but smaller than a mini-ITX PC, means you can maximize your desk space by attaching the device to the back of your desktop display via a VESA mount. Why this matters: We’re well into the era of PCs as appliances and the rise of mini PCs really reinforce that. With little need for disc drives, massive drive bays, or USB thumb sticks, not everyone requires a giant tower under their desks. Tiny PCs like the VivoMini line are well equipped to handle email, productivity apps, and web applications while still giving you that traditional Windows desktop experience without taking up much space. 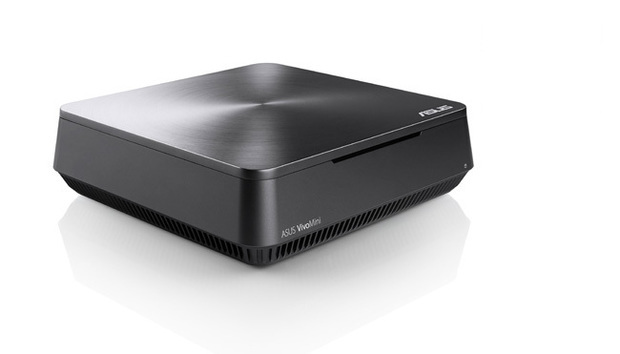 The big difference between the two VivoMini models is that the VM65N rocks an Nvidia GeForce GT 930M mobile GPU. That isn’t a super powerful GPU for serious gaming, but Asus told AnandTech that the GPU is really meant to support photo and video editing, and powering up to three displays at once. Poking around YouTube, however, it looks like this GPU could work for gaming at lower resolutions and graphics settings. I saw examples of laptop gamers getting around 40 frames per second at 1366-by-768 resolution on medium settings, on some relatively modern games. That’s console-level frame rate quality for games like Battlefield 4 and Grand Theft Auto V. It certainly wouldn’t be a premium experience—especially since the VivoMini would use a desktop-sized display—and you can forget about super graphics-intensive games like The Witcher 3, but it's still a neat capability to have in your back pocket. Asus hasn’t announced pricing or a release date for the new VivoMini PCs. « Segway succeeds in stopping hoverboard imports to U.S.